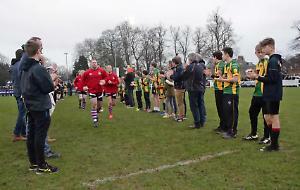 HENLEY COLLEGE students Luke Nelson and Liam Carpenter capped a successful year by being crowned playoff champions with Reading Rockets, with the side already having ended the season as league champions. Four teams headed to Manchester for the National League senior season playoffs last week, where Reading Rockets were drawn against Essex Leopards in the first semi-final. A close-fought match ended 75-70 to the Rockets, with Nelson showing why he was recently voted Division 1player of the year, helping the team get to overtime and eventually win the game with a three-pointer, two free throws and a vital assist to Robbie Parker. The Rockets set up a final against Worthing Thunder, after their opponents had overcome Bristol in the previous round. The final proved to be the Rockets’ easiest game of the weekend with a comfortable 88-57 win to secure the title. Carpenter finished with another impressive stat line of 21 points, seven rebounds and three assists. Nelson had a promising showing with four points and four rebounds.